Blue light protection by using blue filtering lenses should minimize blue light damage to the eye. Many studies are now linking chronic exposure to blue light in the evenings to increased risk of macular degeneration and also increased risk of sleep problems. Eye Care providers both optometrists and ophthalmologists are recommending blue filtering lenses like Blue Light Defense to their patients for the blue light protection. Blue Light Defense and Blue Light Protection is important for all ages. Minimizing Blue Light Damage is critical . Dr Michael Lange discusses the importance of filtering the blue light. 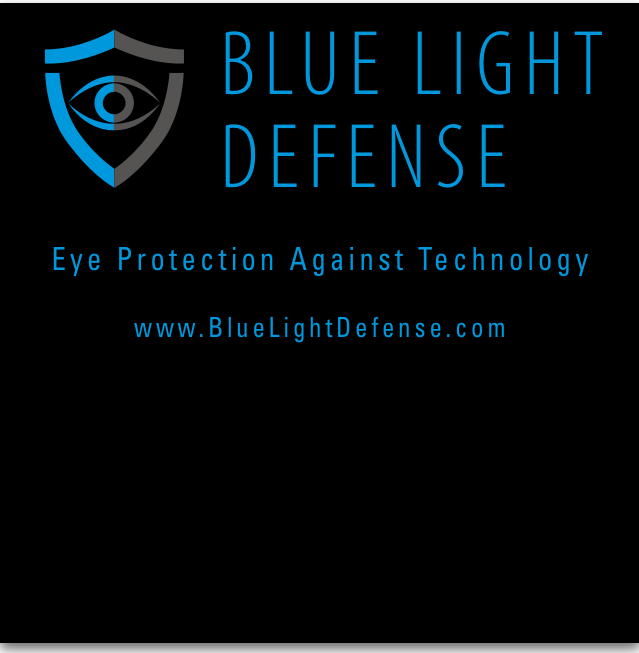 Blue light defense and blue light damage is becoming a main stream topic in the eye care industry. Filtering the Blue Light is proving to be good for the eyes and entire body. Minimizing Blue Light Damage should be addressed by all health care providers and parents. Blue light does have some beneficial effects and is not all bad. The blue light that comes from the sun during the daytime has positive biological effects on the human body. Exposure to Blue light during the day time regulates our internal biological clock and maintains a normal circadian rhythm allowing us so get a good night sleep. Blue light exposure during the day keeps our brain functioning well, keeps us alert and helps maintain psychologically well-being. When the sun sets the Human body is supposed to start to wind down ,relax and get a good nights sleep. In today’s society this isn’t happening do to the pro longed exposure in the evening to various devices that emit blue light. We are using digital devices like smart phones, computers, tablets and even television that are emitting the potentially harmful blue light rays . These frequencies of blue light may interfere with the human biological clock and disrupt sleep patterns. A good nights sleep is crucial for overall health. Blue Light exposure to the eye is becoming more and more prevalent since the majority of us are using digital devices in our daily routines. Studies indicate that chronic exposure to blue light may increase our risk of macular degeneration. Prolonged exposure of blue light from near work on computers, smart phones and tablets increases eye strain , fatigue and dry eye symptomatology. One of the main culprits for computer vision syndrome (CVS) is prolonged near point use on computers that emit blue light. Many lens companies are now selling blue light protection lenses that filter this blue light. All blue filtering lenses are not the same. Some lenses have certain tints that are used to absorb some of this blue light. These lenses can be yellow, orange or purple in color. Some companies are using a coating to absorb the blue light and some are actually putting this filtering technology into the lens monomer so it is throughout the entire lens. Many lens companies are filtering only a small percent of the harmful blue light and some are filtering close to 100% of specific harmful rays. I recommend looking for certain specific characteristics when shopping for blue lens blocking technology. 1. look for a lens that is as close to being clear as possible, lenses that have a tint to them will block some of the transmission of light and decrease night vision, tinted lenses can also be cosmetically un appealing . 2. make sure the blue filtering properties are in the actual lens material ( monomer) and not a coating that can flake off and scratch . 3. ask what percent of blue light and what wave lengths are actually being filtered. 4. check the lens for your self with a blue laser, a good blue filtering lens will block the majority of a blue laser from going thru the lens, this a simple test that will rule out much of the competition. If your lens meets these 4 criteria you will minimize the blue light exposure to your eyes and entire body. A new generation lens I have been using with patients with incredible results since 11/14 that will qualify for all 4 of the characteristics from above is: Blue Light Defense and Blue Light Extreme. These lenses come in a variety of materials and designs. This is brand new technology that is just starting to emerge in the eye care centers throughout the country and wont become mainstream probably until the Fall of 2015. The science is pretty conclusive that we need to filter this blue light especially in the evening when working on computer, tablet, smart phones or watching tv. Relatively new research has been directed at filtering the the blue /violet light . This research also sugests that around 411 nm is one of the worse frequencies of blue/violet light for the retina. 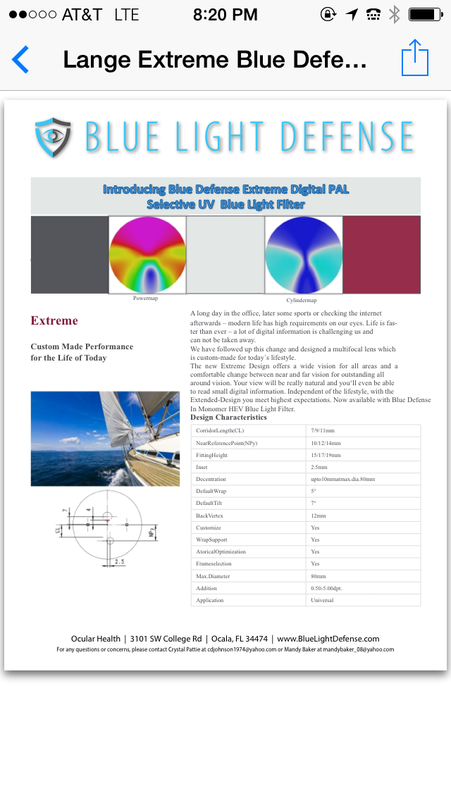 Blue Light Defense filters close to 99% of the waves between 400-420nm. and then filters smaller amounts up 500nm Take control of your future health and your children’s future health by investing in these new blue light defense lenses.